For the jazz listener, operating outside the canon can be a daunting experience. Once you dig 4/4 time, syncopation, swing, cool jazz and hard bop, it is difficult to appreciate other genres. Pop is formulaic and overproduced, and classical, too rigid. Electronics, fahgettaboudit. Machines cannot replace the human capability for improvisation. True, but what if there exists a synthesis of the human and the machine? Then, yes, the electroacoustic can be as enlightening to the jazz listener as the tradition. 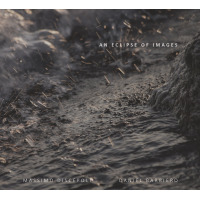 Those are the thoughts that come to mind listening to An Eclipse Of Images by Italian drummer and electronics artist Massimo Discepoli and American bassist Daniel Barbiero. The pair combined the conspicuous sounds of Barbiero's bowed double bass and prepared bass and Discepoli's drummer with ambient and electronic textures. They did so from different continents, not that it is apparent from the recordings. Barbiero, who has recorded with Greg Osby and Andrea Centazzo, and performed with master free improviser Gino Robair , prepared double bass tracks for Discepoli, aka Nheap, adds drums, electric bass, and electronics. The effect is often haunting. The rumble of ambient electronics of "Multiple Horizons" sets a disquieting mood which Barbiero's prepared bass resounds and Discepoli's cymbal work exaggerates the instability. Listeners can paint their own mental picture, a traipse through a cemetery at midnight or edges of a meditative mind. The pair take us through varying emotions, from the brooding and beautiful bowed opening of "An Eclipse Of Images: Atopos," the stadium rock drumming of "Transparency And Its Shadow," and the disc's finest track, "The Occulted Measure" which combines unstable electronics against deep bass, both electric and bowed. Is this music jazz? I'd argue yes; there are improvised pieces and parts assembled in a very thoughtful inspired manner by two sympathetic musicians. Track Listing: Autopoiesis; An Eclipse Of Images: Gathering In; The Occulted Measure; Multiple Horizons; An Eclipse Of Images: Atopos; Transparency And Its Shadow; The Stream Under Consciousness. Personnel: Massimo Discepoli: drums, electronics, electric bass; Daniel Barbiero: double bass, prepared double bass.